Alfred Roubenovich Terterian (by passport), Avet Terterian (in his biography as a composer) was born on July 29, 1929 in Baku, Azerbaijan. His parents were not professional musicians, but both of them had beautiful voices and had some training which allowed his father to perform as an opera singer, and his mother to appear in concert performances. The father, Rouben Terterian, a graduate of medical department of the Saratov University, was known in Baku as a practicing physician – laringologist. Avet’s brother Herman was a renowned opera conductor, and Avet’s son Rouben is a talented musicologist and the author of the book “Avet Terterian”, published in Yerevan in 1989. In 1948 Avet Terterian entered the Baku College of Music. He continued his studies in Yerevan at the Romanos Melikian College of Music (entered in 1951). From 1952, he is a student of the Yerevan State Komitas Conservatory, where he studied compositure with Prof. E. Mirzoyan. Throughout his life, the composer took an active role in public administration and teaching. From 1960 – 1963 he is the executive secretary of the Composers Association of Armenia, and from 1963 – 1965 the vice – president, ditto. 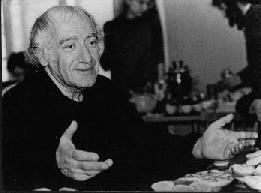 In the period of 1970 – 1974, Avet Terterian heads the Music Sector at the Ministry of Culture of Armenia, where he is also working as the music editor. In 1985 he became the professor of the Yerevan Conservatory, from 1993 – 1994 he gave meisterclasses at the Urals Conservatory, Yekaterinburg), alternated with periods of creative solitude at the Dilijan House of Composers, and after 1989 at his house near Sevan lake. In 1992, Avet Terterian was nominated President of the Armenia – Austria Friendship Society. In 1994, the composer won the Brandenburg scholarship and worked for six months in Wiepersdorf. In 1995, he won a 1 – year scholarship of DAAD, Germany. Avet Terterian died on December 11, 1994 in Yekaterinburg, where he had arrived on December 6, to attend his festival. He was burned on December 19, 1994in the Pantheon in Yerevan, Armenia.